Giving a wedding present is a thoughtful and generous gesture, but it can also be an expensive one. If you've already spent a lot of money on attending a particular wedding or buying something appropriate to wear, you may need some time to save up for the gift itself. You may also just need more time to find the perfect wedding gift for your loved one. Either way, it's important to find out how long you have to give a wedding present to the bride and groom. Traditional etiquette says that you have up to a year following the wedding to purchase and send a wedding present. If you plan to purchase a gift from the registry, however, try to purchase it sooner rather than later. This will ensure that there are still items available and allow the new couple to start using your gift quickly. If time isn't a question at all, it's ideal for you to give a formal wedding present within two months of the wedding. When selecting a gift from the registry, keep in mind that items may be purchased faster than anticipated. If you run out of options, use the couple's shopping list as a jumping board for ideas on gifts the couple may like from the registered store. It's important to remember that, although there are guidelines about how much to spend on a wedding gift, it truly comes down to the thought that counts. In general, it's better to give a gift that's smaller and within a window closer to the wedding, rather than waiting for a long period of time to be able to afford a wedding gift that's more expensive. Luckily, there are many options to choose from for every unique couple. There are all kinds of inexpensive wedding present ideas if you're on a budget and need something soon. Some people believe it's best to give their gifts to the couple at the wedding. While this technically isn't poor etiquette, it also can be extra work for the bride and groom to consider. 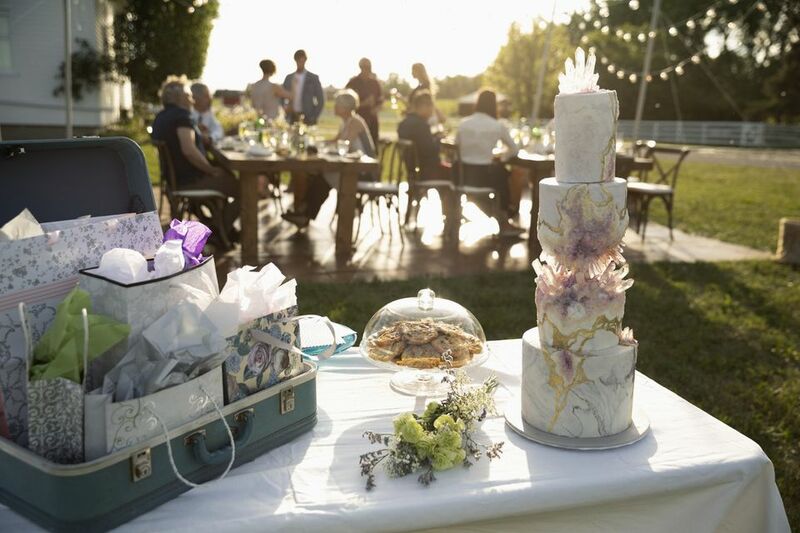 The wedding day is often an emotional rollercoaster full of logistics—creating a situation where someone has to organize who has to bring the gifts home after the ceremony can be a hassle. Instead of bringing a gift to the reception, feel free to bring a card with a check or gift card inside. You can even provide a gift card to where the couple is registered at. Remember that wedding gifts are optional and it's perfectly fine to provide a kind card. If you can, send your gifts to the couple's home address as provided on the wedding invitation or website. Gifts provided two weeks prior to the wedding can be an easier process for everyone. It makes the engaged couple excited about the wedding and their guests, allows them to start removing and replacing items on their registry, and will have them happily stowing away and using their presents as they are delivered.